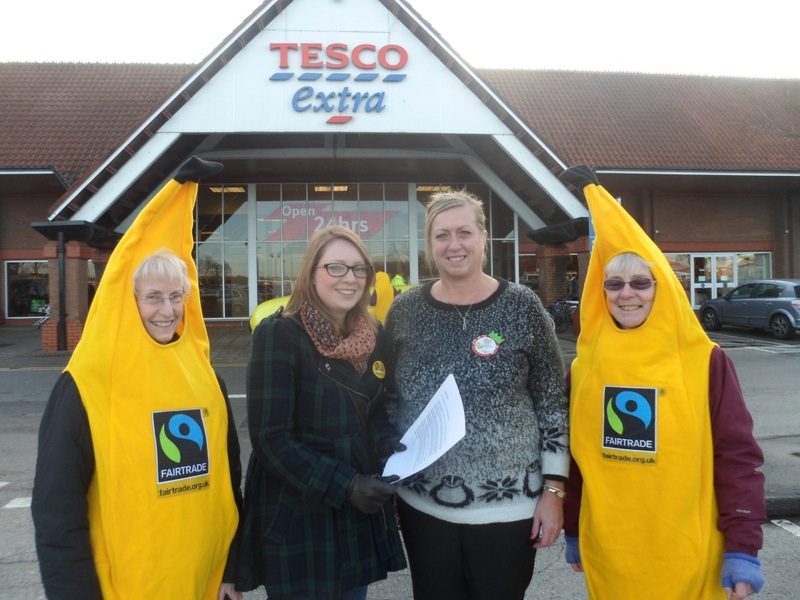 The campaigners were joined by the Fairtrade Councillor for the City of York, Linsay Cunningham-Cross, who handed over letters to the Duty Manager calling for the Tesco store to stock more Fairtrade bananas. 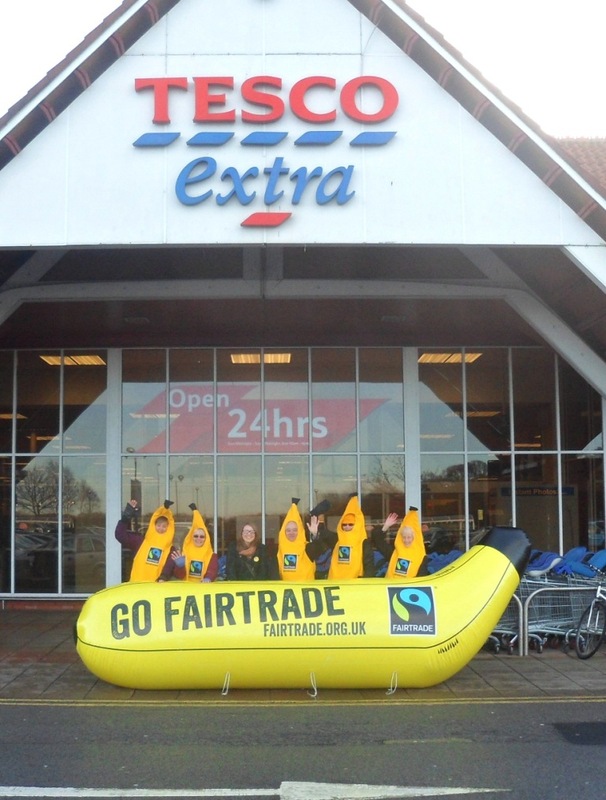 The Fairtrade Foundation’s ‘Asda and Tescos make your bananas Fairtrade’ campaign has been launched as bitter banana price battles between the UK’s biggest supermarkets are trapping vulnerable farmers and workers in poverty. Over the past 10 years, the price supermarkets charge for our loose bananas has halved, whilst the cost of producing them has doubled, leaving many banana farmers and workers caught below the poverty line. 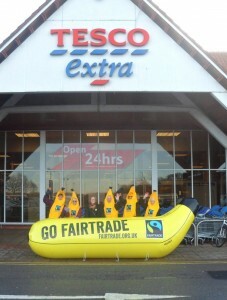 Asda and Tesco are two of the biggest bananas sellers in the UK and major players in this price war. Thousands of farmers and workers grow the millions of bananas they sell each year, yet less than one in ten of these bananas comes with Fairtrade certification, which research shows is the best independent assurance that those who produced them were protected from the pressure of low prices. 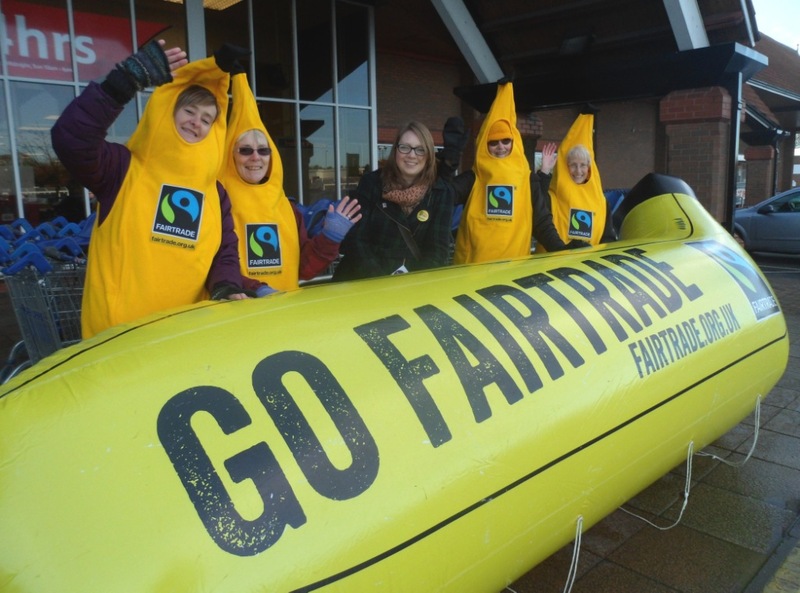 Sainsbury’s, Waitrose and The Co-operative have already acted to give their customers confidence that they’re not squeezing their farmers and workers – 100% of the bananas they sell are Fairtrade certified. 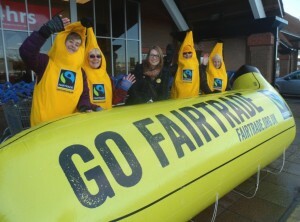 Asda and Tesco, selling less than 10% Fairtrade, lag a long way behind. We need to know that farmers and workers aren’t paying the price for our cheap bananas. Asda and Tesco are negotiating their banana contracts right now so it’s important to act quickly. Students at the University of Leeds can enjoy a fair Christmas after shopping at the annual University Fair Trade and Christmas Fair held in the palatial surroundings of Parkinson Court. 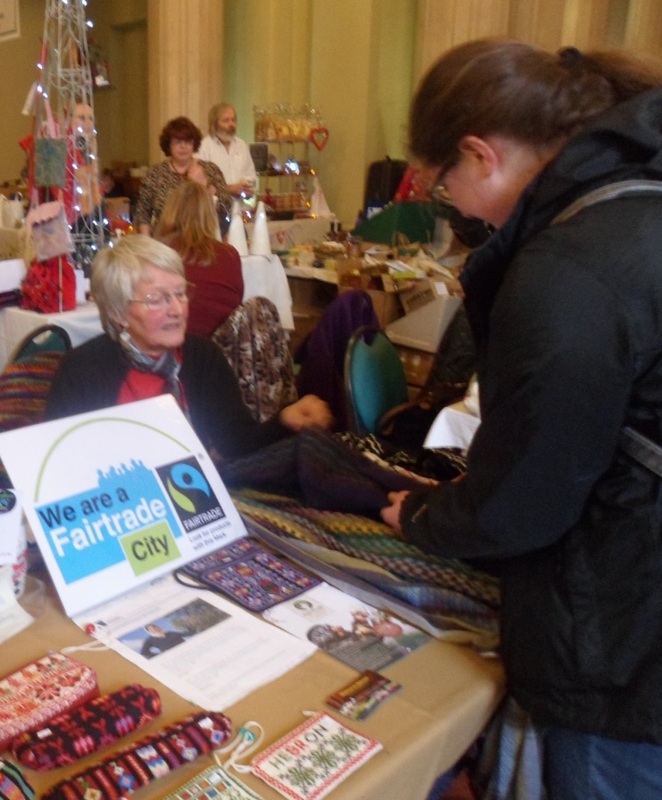 A wide variety of Fair Trade products was on sale including: food and drink items, handicrafts, fashion goods, accessories, stylish bags and jewellery. Traders included Traidcraft, Oxfam and Fairer World. Amongst the special Christmas purchases were Fairtrade christmas puddings, christmas cakes, nativity sets and dates from Palestine. 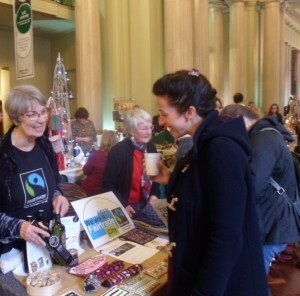 Members of Fairtrade Leeds set up a stall to sell Zaytoun products and to promote Leeds’ status as a Fairtrade City.